Looking for Invisible mode on G-Talk ???? 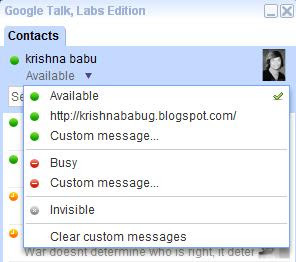 I know many of us are thinking of having a invisible mode option in G-Talk IRC, like Yahoo Messenger. Now it is readily available from Google's new messenger Google Talk Labs Edition, along with many other features like Smileys, Tabbed view, Group chat, Calender,Gmail notification, Orkut Scrap Notification and many more. 0 comments to "Looking for Invisible mode on G-Talk ????"